Adidas may be one of the official sponsors of the World Cup, providing the players with the Jabulani cup ball, but despite all that spend, it’s still lagging behind Nike when it comes to brand awareness. Adidas may be one of the official sponsors of the World Cup, providing the players with the Jabulani cup ball, but despite all that spend, it’s still lagging behind Nike when it comes to brand awareness. A study done for Nielsen analyzed a bunch of social media, blogs, and message boards to discover that the U.S. sports giant is talked about almost twice as much as its German counterpart. Perhaps, in part, due to Alejandro Gonzalez Inarritu’s awesome “Write The Future” ad. Adidas, which is outfitting 12 of the teams, compared to Nike’s 9–including the U.S.A.–can only muster 14.4% of the “official and competitor buzz” as Nielsen has it, compared to Nike’s 30.2%. It’s bought the top banner ad on YouTube (which has readapted its logo for the forthcoming football frenzy) and is showing what can only be Crouching Striker Hidden Beckham (he may not be playing in South Africa, but he’s Yahoo’s “Global Sports Ambassador“)–utterly forgettable, compared to its amusing Cantina ad, in which Beckham makes an appearance–see him toward the end, hiding behind a squeaky voice. The business that is 22 muscly blokes running round a large-ish green rectangle for 90 minutes, in pursuit of a white spherical object, is phenomenally large, as a new NPD study shows. The global football market is valued at $10.9 billion, with the U.S. siphoning off $900 million. Top dog, however, is the U.K., with $1.4 billion being spent on soccer. In 2006, Brits spent almost $245 million on replica football tops. It’s a miracle the country didn’t spontaneously combust, with all that nylon rubbing together at the same time. 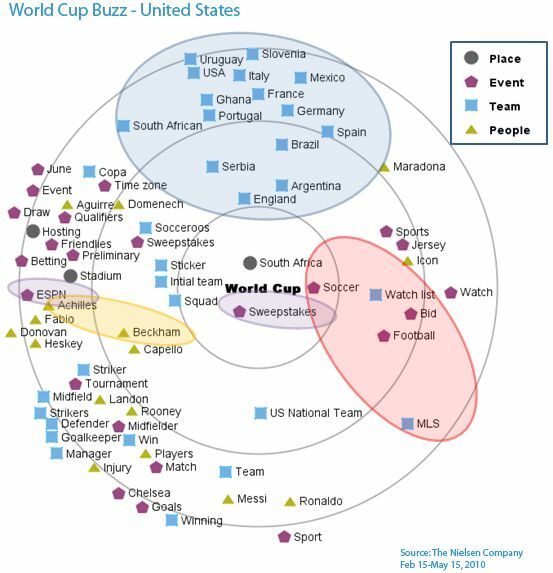 Nielsen also did a cute little piece about what topics were driving the online World Cup conversation. The California-based Beckham and his Italian squad manager, Fabio Capello, were more talked about than U.S. players, with mentions of Landon garnering more than Donovan–somewhat surprising, coming from a country that revels in calling people by their surnames. When it came to secondary competitions, you said Sweepstake, while we said Fantasy Football–speaking of which, have you seen this? Those of you with short attention spans and slightly zonked-out by the prospect of 30 days of grown men crying, might like to sign up to Picklive for a 10-minute, three-a-side version of football. 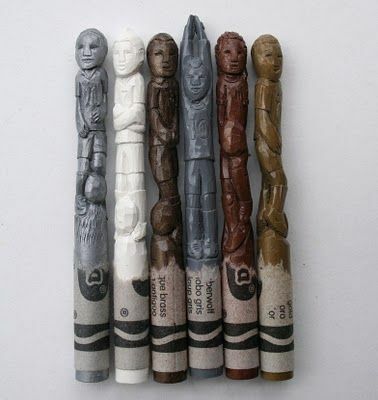 Nike’s press kit, designed by Wieden + Kennedy, contained some crayola crayons hand-carved by Diem Chau. They feature six players–Wayne Rooney, Didier Drogba, Robinho, Fabio Cannavaro, Franck Ribery, and Cristiano Ronaldo–and Chau had 18 days to carve 70 crayons. “There was a week where I slept three hours a night,” she says. For spectators, the key to a good World Cup is being able to master the stats. Emperor Napoleon (I bet he was never picked for the football team when he was at school) called the Brits a “nation of shopkeepers.” At world cup time, however, we undergo a massive transformation into pub bores. No statistic about football is too lowly, boring, or obscure to bandy about while supping your beer (official world cup amber nectar sponsor: Carlsberg). Most popular footballer last week, search engine-wise, was Cristiano Ronaldo worldwide, although former England captain Rio Ferdinand edged it in the U.K., due to his gammy leg. And PaidContent’s digital stats is one for the marketeers. And pub bores. The coolest infographic must be Spanish football daily Marca’s online calendar. It’s interactive–we like–and it’s so hog-whimperingly clever that it almost makes me want Spain to win. After all, they’ve never had much luck in their past World Cup campaigns although, when it comes to scoring, Spanish-speaking commentators are second to none. Still, I’m going for England to lift it on July 11. But then I’m used to disappointments.